I stopped by my brother's place tonight. He told me that he and his girlfriend are looking at places for a wedding reception, which everyone should find funny since the two are still not yet engaged. Curious to this whole wedding process, I asked him who will front the money for this event: him, our parents or April's. Traditionally, it should be the bride's parents, they explained. (And I think back to that Steve Martin movie, my prime reference for this sort of thing, and that seems right.) So I joked that if Todd and April are going to have a traditional wedding, then her parents should also pay us a dowry. Once we settled on livestock as the appropriate currency for this transaction, April suggested that her family's fainting goats would work best. It sounds ridiculous, but apparently these animals actually exist. Also known as "Nervous goats," "Stiff-leg goats, "Wooden leg goats" and "Tennessee Scare goats," this particular breed are genetically predisposed to react to predators by becoming rigid and falling over. (Oh, how wonderful my childhood could have been.) The condition is called "myotonia." 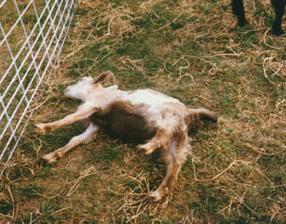 Here is a photo of a myotonic goat. I know it looks like a sleeping cat, but I have to believe that the International Fainting Goat Association would post a picture of a cat in place of a goat. No wait. Here is a better picture. I'd delete the first one, but I find it too amusing it its cat-like qualities. 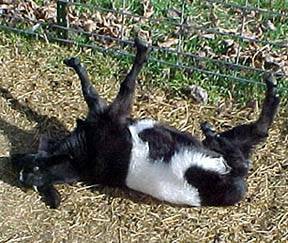 According to April, the function of the fainting goat is to use them as sacrificial bait for predators. If you stick a fainting goat in with a flock of sheep, for example, it will keel over when the wolves show up, allowing the sheep time to escape while the wolves strip his stiff, little body of goat-meat. I suppose you could say that you'd be using your fainting goat as a bit of scapegoat, though the etymology for the latter term doesn't support the theory, I'm shocked to find.